Kuldeep Yadav and Yuzvendra Chahal picked up 6 wickets between them to rattle the Kiwi batting line-up. 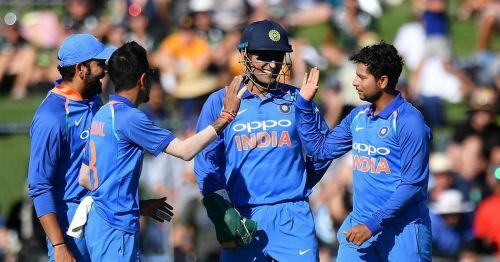 After winning its first ever bilateral ODI series in Australia, the Indian team took on Australia's neighbors New Zealand in the 1st ODI of the 5-match ODI series at Napier with an eye to continuing its winning momentum. New Zealand skipper Kane Williamson won the toss and decided to bat first on a flat pitch. However, Williamson's decision to bat first backfired as Indian bowlers had the Kiwi batsmen in all sorts of trouble right from the start and dismissed them for a paltry score of 157 runs in 38 overs with Mohammed Shami, Kuldeep Yadav, Yuzvendra Chahal, and Kedar Jadhav sharing the wickets between them. For New Zealand, their skipper Kane Williamson was the only batsman to put up some fight and scored a fine half-century. Chasing a low total of 158 runs, team India lost Rohit Sharma very early. However, Shikhar Dhawan and Virat Kohli added 91 runs for the second wicket as India romped home to an easy victory with 8 wickets in hand. Incidentally, the win at Napier was India's first ODI win against New Zealand at their soil since 2009. With the match done and dusted, let's see how the players from both sides fared in this one-sided encounter. 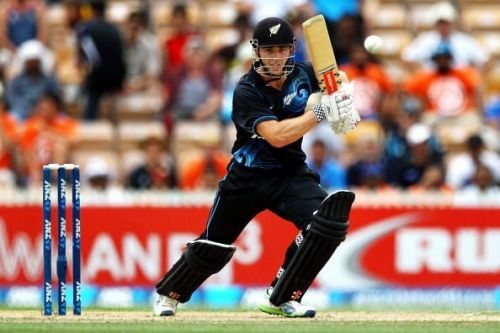 Kane Williamson was the top scorer for New Zealand with 64 runs off 81 balls. Guptill had a torrid time while batting as he regularly failed to pick up Mohammed Shami's deliveries and was eventually clean bowled by Shami after scoring just 5 runs. Just like his opening partner, Munro was also castled by a peach of a delivery from Shami for just 8 runs. Williamson was the only Kiwi batsman who looked comfortable while facing the Indian bowlers and scored a handy 64 runs off 81 balls before being dismissed by Kuldeep Yadav in the 34th over. The Kiwi veteran and the man in form for the home side got off to a good start and looked solid before being dismissed by Yuzvendra Chahal for 24 runs against the run of play. It also turned out to be the turning point of the match as the middle order collapsed after his dismissal. One of the best players of spin in the New Zealand batting line-up, Tom Latham did not have a good match as he was also dismissed by Chahal for just 11 runs. The 27-year-old tried to bring the New Zealand innings back on track by adding 31 runs for the 5th wicket with skipper Kane Williamson but lost his wicket after playing a horrible shot off the bowling of Kedar Jadhav for 12 runs. Santner did not have a good match as he was trapped in front by Mohammed Shami for 14 runs and was ineffective with the bowl as he failed to pick up a single wicket which was the need of the hour if the home side hoped to put up a fight. Doug Bracewell was the best New Zealand bowler on display as he bowled a tight spell of 7-0-23-1, claiming Rohit Sharma's wicket in the process. The experienced Kiwi pacer did not have a good game either, as he could neither contain the run flow nor pick up a wicket and ended up bowling an expensive spell of 6.5-0-36-0. Despite picking up the prized wicket of Virat Kohli, Ferguson did not trouble the Indian batsmen much and ended up with the bowling figures of 8-0-41-1. Despite creating many chances in his opening spell, Trent Boult was unlucky not to pick up a single wicket in his 6 overs.